Lidia Matticchio Bastianich (born February 21, 1947) is an American chef who was born in present-day Croatia. She specializes in Italian-American cuisine, and became a TV celebrity with her cooking shows. She has been a regular contributor to the PBS cooking show lineup since 1998. In 2007, she launched her third TV series, Lidia's Italy. She also owns four Italian restaurants in the U.S. in partnership with her son, the winemaster and restaurateur, Joseph Bastianich: Felidia (founded with her ex-husband, Felice) and Becco in Manhattan; Lidia's Pittsburgh in Pittsburgh, Pennsylvania; and Lidia's Kansas City in Kansas City, Missouri. Lidia Matticchio Bastianich was born on February 21, 1947, in the city of Pola, Istria (present-day Pula in Istria County, Croatia). Istria had been awarded to Italy after World War I. Later, after World War II, Istria was ceded to the then-recently created Yugoslavia by the terms of the Treaty of Peace with Italy, 1947. This occurred just eleven days before Lidia's birth. The treatyprovisions were not fully enacted until September 15, 1947. In the intervening period, many Italian Istrians, fearing what would come to be known as Titoism, chose to flee, emigrating to Italy. In 1958, when Lidia was 10 years old, her father, Vittorio, sent his wife, Erminia, and their two children, to visit family in Italy. Vittorio remained in Istria as per a requirement that "one member of the family … remain in Istria as a hostage to ensure that the family would return." Hours later, Vittorio fled across the border under the cover of darkness while almost getting shot by border guards. The Motika family reunited in Trieste, Italy, joining other displaced families in a refugee camp named Campo Profughi, which had been the Nazi concentration camp, Risiera di San Sabba, during the Second World War. A wealthy Triestian family hired Lidia's mother as a cook/housekeeper and Lidia's father as a limousine driver. After two years living in "displaced persons" status in Trieste, the family was able to obtain relocation placement in the U.S. The family arrived in New York in April 1958. The Catholic charities brought us here to New York … We had no one. They found a home for us. They found a job for my father. And ultimately we settled. And I am the perfect example that if you give somebody a chance, especially here in the United States, one can find the way. Supported for a few weeks in New York by Catholic Charities, which had sponsored their emigration, the family soon moved to Astoria, Queens. Many Istrians had previously settled in Astoria as a result of the two World Wars and the family had a distant relative there. In Astoria, Lidia's father took a job as a mechanic at a Chevrolet factory, and her mother, "who had been an elementary school teacher, did piece work for the Evan Piccone clothing company," while Lidia cooked the family's nightly meals. Lidia came by her love of cooking naturally having been raised in Istria by her parents and an extended family that included her grandparents who "ran a trattoria and grew most of the food they sold and ate, producing their own olive oil and wine, distilling their own grappa and curing their own meats." During her youth, Lidia worked after school in Walken's Bakery which was owned by the parents of Christopher Walken. In her third cookbook, Lidia’s Italian-American Kitchen, Lidia writes that her family was among the thousands of Istrians who came to the United States to make a new home for themselves, especially in the post-WWII era, when some Istrians risked their lives to escape from behind the Iron Curtain. The Istrian immigrants joined many other Europeans who came as refugees of World War II and communist dictatorships during the late 1940s through 1950s. As for Italians per se, more than 4.5 million Italians had entered the U.S before 1920, many from South Italy (e.g., Sicily, Campania, and Puglia). Due to the influx of so many Southern Italian immigrants, the Italian-American cuisine and culture became well established in the U.S.; Italian-American cuisine eventually branched off into a style of its own, with unique adaptations of Italian recipes for the American palate and with more readily-available American ingredients. I don’t remember life without cooking. My grandmother had a little inn in Istria, and she cooked for all the laborers coming into town. I helped with the little tasks, like shelling beans. But my grandparents did it all–they farmed, and they also processed their own olive oil, distilled grappa. In several episodes of her various television series, Lidia has related the story of the early years of her family's life in America and their struggle to find their way financially in a new country. To help bring in money for her family, 14-year-old Lidia got a job at a bakery on Broadway in Astoria named Walken's Bakery, owned by the parents of actor Christopher Walken. After high school, Lidia worked full-time in several Italian restaurants in Astoria. She met her future husband, fellow Istrian immigrant Felice "Felix" Bastianich at her sweet sixteen party. The two married in 1966 and their first child, Joseph, was born in 1968. Lidia became pregnant with their second child as the pair planned to open their own restaurant. By 1971, the family had opened their first restaurant, Buonavia, meaning "on the good road", in the Forest Hills neighborhood of Queens. They came up with their menu by collecting menus from the most popular and successful Italian restaurants in 1971, and hired the best Italian-American chef they could find to execute their plan. After a brief break to deliver her second child, Tanya, Lidia began to work as the assistent chef at Buonavia to learn whatever she could. She gradually learned enough to make high-quality Italian food while adding Istrian traditional dishes to the menu. The success of Buonavia led to the opening a second restaurant in Queens, Villa Secondo. It was here that Lidia first gained notice by food critics and cookbook authors, and here where Lidia began giving live cooking demonstrations, a prelude to her eventual career as a TV Cooking show hostess. In 1981, the family sold their two Queens restaurants and moved to Manhattan to create what would eventually become their flagship restaurant, Felidia (a portmanteau combining "Felice" and "Lidia"), in a small Manhattan brownstone. After over $750,000 worth of renovations and liquidating nearly every asset they had to build the restaurant of their dreams, Felidia finally opened to near-universal acclaim from food critics around the country. According to Lidia's Italian-American Kitchen, Felidia received "three stars from the New York Times and nationwide recognition for serving 'true' Italian fare." In 1993, Julia Child invited Lidia to film an episode for Child's upcoming PBS series, Julia Child: Cooking With Master Chefs, a series featuring acclaimed chefs from around the U.S. cooking dishes in their own home kitchens instead of within a restaurant setting. The series gave Lidia an instant boost of recognition and strengthened Lidia's desire for expansion of the Bastianich restaurant franchise; by 1997, Lidia and Joseph had opened their first restaurant outside of Manhattan, Lidia's Kansas City. Lidia's restaurants were now a true family-run business in the late 1990s: Erminia Motika maintained the large garden behind the family home, from which Lidia would choose ingredients for use in recipe development; son Joseph Bastianich was now the chief winemaster of the restaurant group in addition to branching out into his own restaurant line with their old friend and famed Italian chef Mario Batali; daughter Tanya Bastianich Manuali parlayed her Ph.D in Italian art history into co-ownership with her mother of a high-end travel agency called Lidia's Esperienze Italiane, where Tanya and her friend Shelly Burgess Nicotra (the wife of Felidia's Executive Chef Fortunato Nicotra since 1996) conducted tours throughout Italy to study the historical architecture and sample true Italian cuisine; Tanya's husband, attorney Corrado Manuali, became the restaurant group's chief legal advisor. However, Felice and Lidia began having disagreements about the direction their lives had taken - most notably, the pace of the expansion and character of their business - and the couple finally divorced in 1997. They remain close friends. Since the divorce, Lidia has continued expanding her business interests with her son as her partner in the restaurant opening of Lidia's Kansas City. 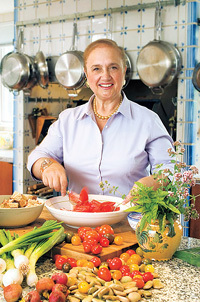 In 1998, PBS offered Lidia her own cooking show, which became Lidia's Italian-American Kitchen. Lidia Bastianich has been a fixture in the PBS cooking show lineups ever since, hosting two additional television series, Lidia's Family Table (still in reruns around the U.S.) and Lidia's Italy, launched in April 2007. Lidia closes out every episode with an invitation to join her and her family for a meal, "Tutti a tavola a mangiare" (Italian for "Everyone to the table to eat"). She also appeared on an episode of the 2006 PBS series Chef's Story. She also owns her own television production company, Tavola (Italian for "table") Productions. Lidia resides in Queens, New York, with her mother Erminia Motika (widowed in 1981). Lidia's kitchen has served as the set for all three of her TV series, and the garden that Erminia maintains provides many of the ingredients used in featured recipes for the shows. Erminia, who answers to "Nonna Mima" on-camera, frequently serves as a sous-chef in Lidia's various TV series. Joseph Bastianich, his wife Deanna, and their three children (Olivia, Miles, Ethan) live in Westport, Connecticut, but frequently return to New York to handle business matters for the Bastianich restaurants. Tanya Bastianich Manuali, her husband Corrado Manuali (who serves as legal advisor to the ever-growing Bastianich gastronomy empire), and their two children (Lorenzo and Julia) live on Long Island just a few blocks away from Lidia's house. Tanya serves as the main on-camera culture expert for the segments that are filmed in Italy as part of Lidia's 2007 PBS series, Lidia's Italy. All four generations of the family have appeared at one time or another as contributors to Lidia's TV shows; Lidia's Family Table frequently featured Lidia giving simple pasta shaping lessons to her young grandchildren, and episodes of Lidia's Italy often feature the adult Bastianiches touring the various areas of Italy significant to their family as well as to the recipes demonstrated in the episodes. "...food for me was a connecting link to my grandmother, to my childhood, to my past. And what I found out is that for everybody, food is a connector to their roots, to their past in different ways. It gives you security; it gives you a profile of who you are, where you come from."